On the morning of his 40th birthday on June 12, Ned Bell took off on a 900-kilometer bike ride. And it wasn't just any bike ride, but a trip across Vancouver Island in hopes of increasing awareness of our food system. Broken down in numbers, the trip boils down to 40 years, 900 kilometers, 4 days. What a guy! 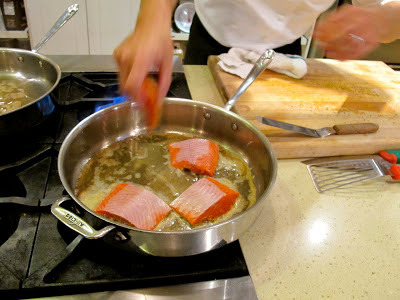 Ned knows his way around the kitchen, cooking BC salmon here in Calgary. Ned Bell is the Executive Chef at Four Seasons Hotel Vancouver. I met him while on a week-long culinary press trip through Alberta in 2010. Even then, he was touting the benefits of supporting local farmers and fishermen, along with food producers and artisans of all types. Since then, his focus has embraced making food choices that also help improve the quality of our oceans, lakes and rivers. 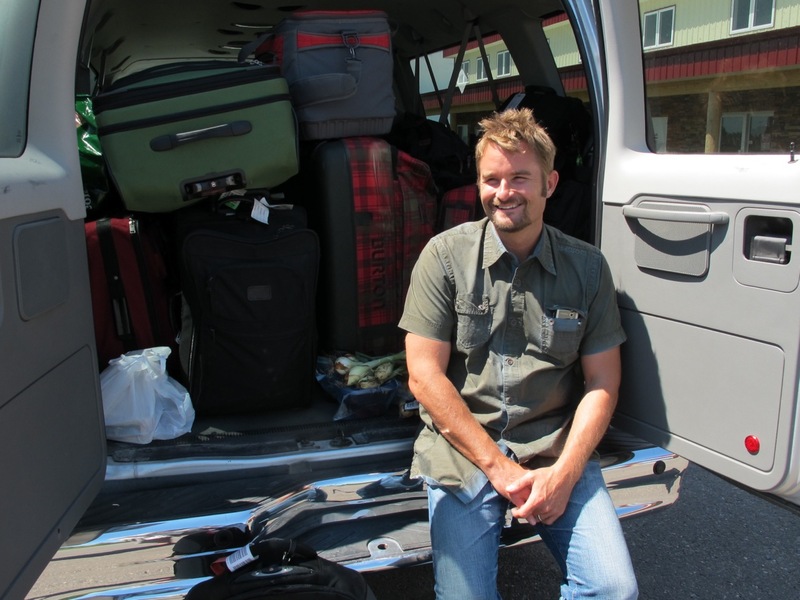 No surprise that he donates his talent and time to the Vancouver Aquarium's Ocean Wise program, SeaChoice, National Sustainable Seafood Day and the Canadian Parks and Wilderness Society (CPAWS). Ned is making a difference. On May 3, 2013 Bell and a dedicated team drew a crowd of 500+ people to a Vancouver celebration supporting the creation of a National Sustainable Seafood Day. Dr. David Suzuki was the event's keynote speaker, along with Barton Seaver, the director of the Sustainable Food Program at Harvard's School of Public Health and also a National Geographic fellow. Bell calls the event a "life highlight." Others have noted Bell's impact. Dr. John Nightingale, President and CEO of the Vancouver Aquarium, singled Bell out as an individual making a positive difference against the grave threat of overfishing. "Bell's spirited efforts in helping us conserve our oceans is leading change in the culinary landscape one dish at a time," said Nightingale. Bell's 40th birthday bike ride also marks the culmination of two years of focusing on his own personal health and wellness, which included countless kilometers of road biking and marathon running. Now fit and focused, the chef is beginning a new decade thinking bigger, broader and bolder than ever before. "It's amazing to see what can be accomplished if you are really committed to change for the better," said Bell. He's grateful for the support he's received for the ride, including his family (wife Kate Colley and his son Max), along with his sponsors: Mountain Equipment Co-op, Gran Fondo Canada, Mercedes-Benz Canada, Ocean Wise, SeaChoice, The EDGE Food Energy Company, VEGA and Velofix. June 12 - Depart Four Seasons Hotel Vancouver at 6 AM - 260km ride from Swartz Bay to Nanaimo. Overnight in Nanaimo. June 13 - 300km ride up the Malahat. Overnight in port McNeill. June 14 - 300km ride to Port Hardy. Overnight in Campbell River. June 15 - Cruise day into Comox for the BC Shellfish Festival.